This is no ordinary discovery. It is set to rewrite the history of Muslims and humankind for ever. Never in the history of the world did the women experience such empowerment, freedom, dignity and respect as was in the Islamic history. However this part of the history of Muslims has been long forgotten and largely unexplored. But not any more. 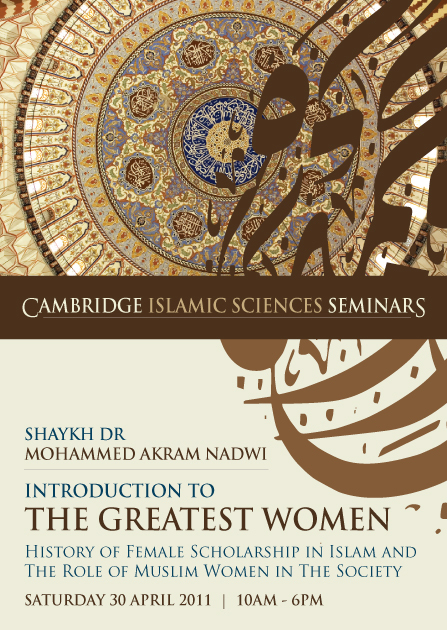 Oxford based researcher and scholar Dr Mohammed Akram Nadwi has uncovered a large body of evidence to show that for a greater part of the Islamic history Muslim women were an integral part of Islamic scholarship and were deeply involved in the formation of the Sharia'h from the time of Prophet Muhammad until as recently as 200 years ago. Women were respected as scholars, jurists and teachers in addition to their dignity as mothers, wives and daughters. Many were successful entrepreneurs too. His ground-breaking research spanning over 8 years has so far uncovered biographies of over 8000 female scholars dating back to the time of the Prophet. These women-scholars wielded positive influence upon the general public, the ruling class and the male scholars of their time. Many were the teachers and mentors of the famous male scholars whose names we hear about so often today. Unfortunately not many people (including Muslims) know about this. Now this your opportunity to discover this yourself with a historic and rare one-day seminar with Dr Mohammed Akram Nadwi himself. In addition to the historic accounts, the seminar will focus on bringing back this lost tradition back to life. This is the first and the only time for the moment he is doing a full day seminar of this kind. So this may be your only opportunity take part in such an important life- and history-changing seminar. If you are quick to register you may still find up to half price or even less tickets (buy-one-get-one-free, group tickets) for this priceless event. Or have a free signed copy of his book "The Women Scholars of Islam" (worth £16) with the entry ticket. It is this Saturday so be quick! In case you are still not convinced that you should attend this seminar please read the testimonials about the seminars of Dr Mohammed Akram Nadwi and reviews of his work on the New York Times and London Times. This is real stuff by a real scholar, not the mumbo-jumbo of the self-styled "progressives" or "reformers".